SutiSign is an electronic signature solution that automates document signing and authorization processes, targeting the needs of businesses of all sizes and kinds. Compliant with eSignature laws and acts such as ESIGN, UETA and EU directives, the system adds security measures including biometric authentication and secure 128-bit encryption storage. This allows users to safely create documents templates including embedded signature points and custom form fields, while also uploading existing documents in a variety of file formats. Documents can then be rebranded with custom logos before setting approval orders, nominating who can sign and then raising requests for single or multi-party signatures. Authorized parties can then have their contacts referenced from a centralized address book, before making a choice over how they sign the request. Flexible signing options not only include in-person signing via mobile app, even when offline, but also with a system generated signature, an uploaded scan or hand-drawn with the mouse. Supplementary documents can be attached by senders during the signing process, along with any added request comments, while automatic expiry reminders also alert to pending signature request expiration. Additional notable features include dashboard analytics for viewing real time signature status data, plus a number of integration options for popular cloud-based services, API availability and the ability to embed SutiSign into an existing website. SutiSign has helped us drastically reduce the amount of paper we once used.The software is fairly easy to use and the customer service is phenomenal. The software is fairly easy to use and the customer service is phenomenal. The alignment of the text vs when you configure the form is difficult to difficult to get right. However, this is something that they have been working on and is getting better. Ease of use and having the staff be able to file in their own personnel files. Also, having evaluations/performance items all in one place. Need to always contact the support staff for help or misunderstandings of how we set something up. Otherwise, love the software. I love being able to have policies online that can be digitally signed by all employees. The ease of tracking who has signed what and what is outstanding is awesome! Just a little tricky to navigate sometimes. Had issues trying to configure a new document, response from customer service was not fast enough. Very easy to use. It literally takes less than a minute to get a document ready for someone to sign. I have no negatives from me for the SutiSign product. A free trial is available upon request, via the SutiSign website. 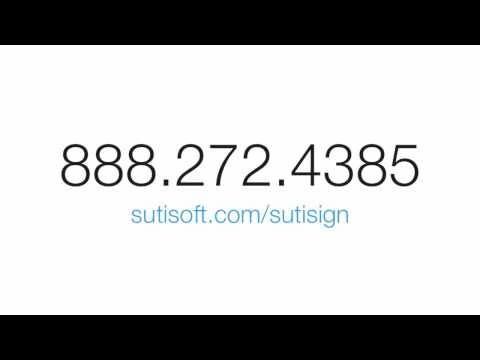 • SutiSign is 128-bit encrypted, e-sign act complaint solution that automates the collection of electronic signatures on digital documents such as sales contracts, vendor agreements, NDA's and more. • Businesses and users of all sizes and kinds can use SutiSign to create document templates carrying customizable branding, adding signature points and custom fields as desired before sending signing requests to single or multiple parties. • Signing contacts are saved within a centralized address book while role-based permissions can be used to dictate who can see and approve documents depending on privileges, with all user activities logged in an audit trail. • Signatures can be captured from any device including in-person on mobiles, whether on or offline, with other accepted signature options including a predefined system generated signature, an uploaded scanned example or a hand-drawn version via mouse. • Real time dashboard-based analytics provide chart visualizations on signature status, with reports made sharable through data export, print and email. Below are some frequently asked questions for SutiSign. Q. What type of pricing plans does SutiSign offer? Q. Who are the typical users of SutiSign? Q. What languages does SutiSign support? Q. Does SutiSign support mobile devices? Q. Does SutiSign offer an API? No, SutiSign does not have an API available. Q. What other apps does SutiSign integrate with? Q. What level of support does SutiSign offer? Q. Which apps is SutiSign compared to most often?